Pre-planning a trip to the UK is as exciting as it is important. Home to four different countries, each with distinctive cultural identities, landscapes and histories, it can sometimes seem that there is simply too much to see in too little time. But do not fret; that is where we come in! Sharing our own personal experiences from our own recent trip to Scotland, the below guide can assist you when it may be that time isn’t always on your side. 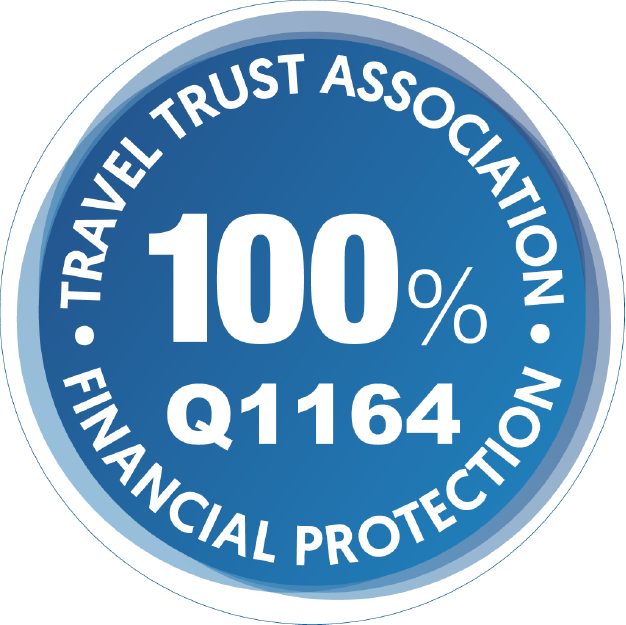 Planning a vacation to England and Wales but want to squeeze Scotland into your already full schedule? This is how you can add a full experience of Scotland to the picture in just 4 days. What better way to start than the Scottish capital city? A picturesque walk through history, the city of Edinburgh encapsulates the very soul of Scotland and defines what it means to be Scottish. Huge flags sway proudly in the breeze, as the ringing sound of bagpipes reverberates throughout the entire city. From the centre, stroll up the Royal Mile, a vibrant stretch of Whisky tasting, Tartan kilts, century old inns & Haggis on toast, leading right up to Edinburgh’s crown Jewel (quite literally); Edinburgh Castle. Once inside, walk the castle grounds & discover the turbulent history of the Scottish wars of independence & the Scottish Monarchy. Enjoy panoramic views of Edinburgh from the city’s most spectacular view point before heading back down the Royal Mile. By evening dive into Edinburgh’s bustling night life, grabbing a fresh pint of ale or a wee dram of Scotch Whisky after an epic first day in Scotland. Adeo tip: Not flying into Edinburgh but short of time? 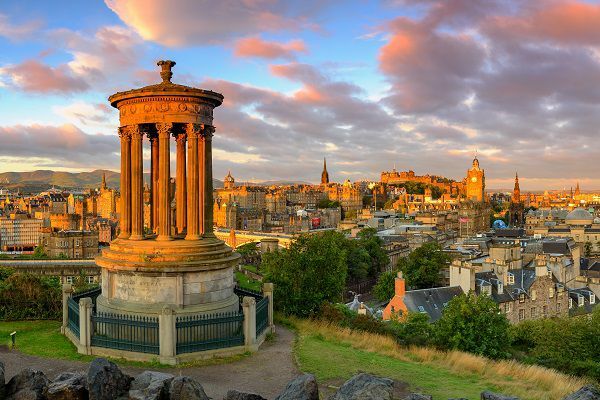 A high-speed rail link from London can get you to Edinburgh in just 4 hours 20mins! 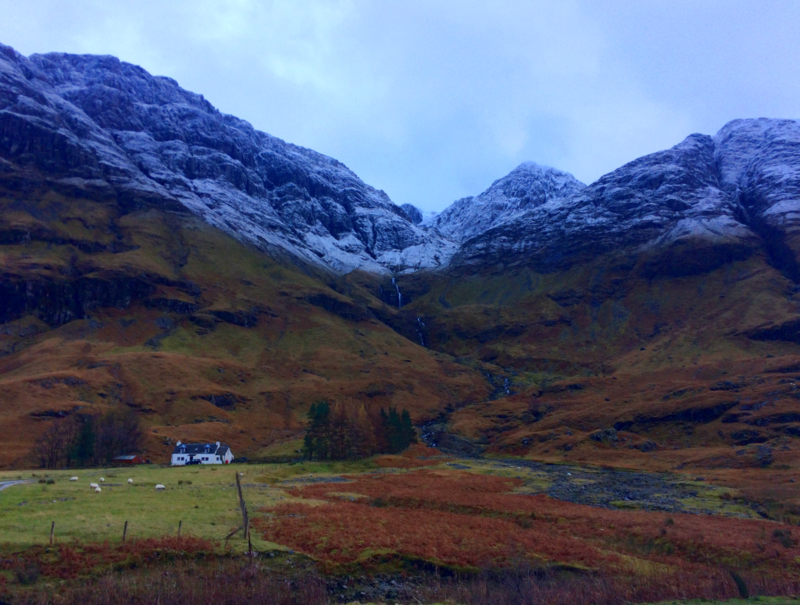 Day 2: The west highland way – Loch Lomond, Glencoe Valley & Fort William. 4 days may not seem a long enough time to experience the dramatic landscape that Scotland is so famed for but take it from us; the west highland way is an unmissable route that can easily be worked into your day-to-day planning. Labelled the Highlands in miniature, the staggering beauty and rawness of this incredible journey will fill your soul as you pass into the west of the country. 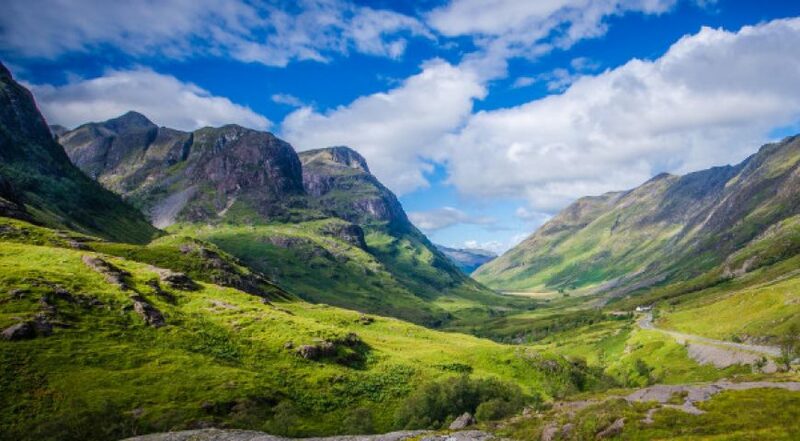 Take the road parallel to Loch Lomond, the UK’s largest Loch (Lake in Scottish) and traverse through the mountainous landscape of Glencoe Valley. And what’s better; the route is not only accessible by car. A trainline from Glasgow to Fort William runs adjacent to Loch Lomond through the woodlands and offers fantastic views of the surrounding region. Adeo tip: For self-drivers, be sure to take your time on this route. There are plenty of spots to pull into for photos and a great gasp of highland fresh air. Day 3: Glenfinnan, Loch Ness, Urquhart Castle & Inverness. This morning begins at the foothills of the mighty Ben Nevis, the highest peak in the UK, later making the short journey to Glenfinnan. 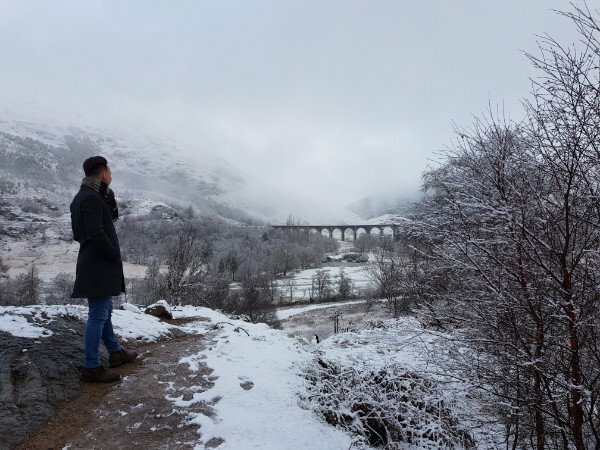 The iconic Glenfinnan viaduct (as seen in the Harry Potter movies) and the Jacobite monument are must visit locations, again both accessible by car and train, the major difference being that rather than viewing the viaduct, you’ll cross over it on the train! By early afternoon continue alongside Loch Ness (but not too fast… you don’t want to miss spotting Nessie! ), stopping at the historical site of Urquhart Castle, perched on a rock overlooking the Loch. After your next history lesson, make the short journey to Inverness; capital of the Scottish Highlands. Adeo tip: The West Highland Line from Fort William to Mallaig is shared with the world-famous Jacobite steam train. The steam train stops on the viaduct to allow for wonderful snaps! These tickets are in incredibly high demand, so its best to enquire as soon as you can. 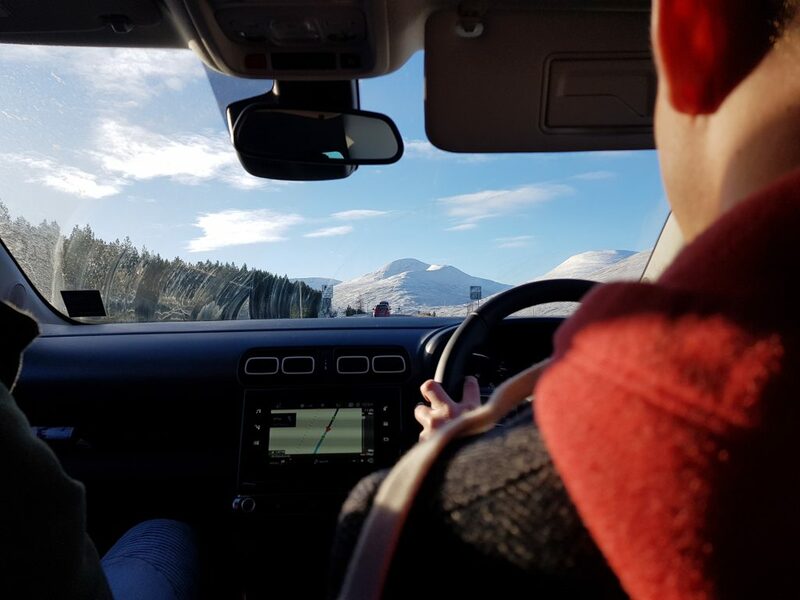 Self-driving view of the Cairngorms. Day 4: Pitlochry, Stirling & Glasgow. So, in just three days, we’ve experienced the capital, the highlands & the history that Scotland has to offer the keen traveller. Today, the journey south tops everything off with a visit to three quintessential Scottish towns off the beaten track. 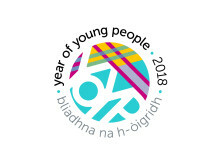 First, pass through the magnificent Cairngorms national park, a splendid backdrop of rolling hills and mountains before stopping for an early (or late… up to you!) lunch in the quaint village of Pitlochry in county Perthshire. Neighbouring the village of Blair Atholl, you may choose to visit the world-renowned Whisky distillery or the opulent Blair Castle. This afternoon, continue to the historical town of Stirling, another quintessential Scottish town steeped in history. Stirling Castle sits atop of the town and can be seen from view as you approach. Mix with the locals and get a feel for the Scottish way of life in this wonderfully quaint stop over before making the last leg of your journey to the city of Glasgow. After a busy day final day, experience Scotland’s largest city and enjoy Kelvingrove Park and Museum, the stunning Glasgow Cathedral and Necropolis to cap off your Scotland experience perfectly. Adeo tip: time depending, you may also be able to fit in a visit to St Andrews, a gorgeous university coastal town that harboured the romance of Prince William and the Duchess of Cambridge Kate Middleton. And there you have it! A full experience of Scotland’s cities, landscapes, culture, taste, history, music & lochs in this wonderfully condensed 4-day tour for those short on time. Of course, if you want to venture further into the highlands (perhaps the famous NC500 road?) you’ll need to stay a little longer. But take it from my very recent experience, this 4-day trip will provide more than just cherished memories. Fly home from Glasgow or, now that time IS on your side, continue across the border into northern England to complete your once-in-a-lifetime experience of the United Kingdom.